The objective of this soccer drill is to help young players improve the speed of play by thinking a step-ahead of the play. Form a circle with each of the players on your team. 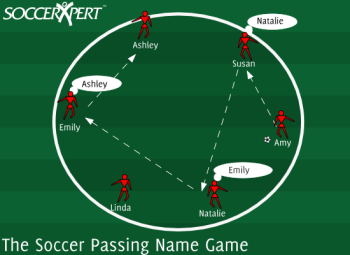 To play the name game, the player with the ball passes to a player. Before the receiving player receives the pass, they must yell the name of the next player in which they are going to pass. Upon the next player receiving the ball, they must yell the name of the next player in which they are going to pass. This is designed to make the players think a step ahead of the play. Make sure that each player has at least two touches on the ball; one touch to receive the pass, and the other touch to make the pass. Encourage players not to make a pass back to the player they received the pass from, and to pass to different people each time. Remind players to be thinking ahead to determine who they want to pass. Create a grid and play the same game as above except players are free to move about the grid.